TOTOWA, N.J., February 25, 2011 – Dydacomp, a leading provider of business technology platforms for ecommerce and multichannel merchants, announced today that SiteLINK Ecommerce clients experienced the highest total revenue since the launch of the platform in 1997. In 2010 SiteLINK merchants saw total revenues of over $350 million; an increase of 13% over 2009. In addition, 2010 broke SiteLINK client records for total visitors with over 450 million visitors. This is a represents 14% boost over 2009. “Our SiteLINK Ecommerce solution provides our clients with not only flexible and intuitive design options, but also search engine optimization and selling tools that are proven to help merchants drive traffic to their sites and increase conversion rates,” said Al Pascale, Dydacomp Manager of eCommerce Services. The Internal Revenue Service announced last week that the sales of gift cards do not have to be counted as taxable income until they are redeemed even if they were sold through a subsidiary or franchise, or are issued as a refund for returned merchandise. Previously the regulations regarding gift cards stated that income could be deferred as long as the cards were redeemable with merchandise from the company that sold them. Problems arose because most retailers have subsidiaries that handle and sell gift cards; the IRS contended that the income is taxable upon the time the gift card was sold even if it was redeemed by another division in the company. The National Retail Federation argued that the income from gift cards still goes to the same company regardless of whether the cards are sold directly by the parent or through a subsidiary. The deferral of taxable income on gift cards doesn’t affect retailers if the cards are redeemed in the same year they are purchase. However, the deferral can be a large factor in retailer’s tax liability when a card is sold in one year and no redeemed until the following year. This often happens during the holiday season. The IRS now says that gift card income can be deferred regardless of whether the cards are redeemed by the parent company, a subsidiary or a franchise. Does this new ruling affect your business? How do you feel about this new ruling on when gift cards become taxable? Check out further information on the National Retail Federation site. How was your 2010 holiday season? What will you do differently this year compared to last year? Let us know what you saw as we aim to compile as much information about what worked in 2010 and what will be the top trends for Ecommerce Retailers for 2011! Thanks! We look forward to hearing your insight! From all of us here at Dydacomp we hope you had a successful holiday season, and we wish you happy holidays with an even better New Year in 2011. Whether anyone wants to admit it or not, the holidays are coming to a close as the year slowly winds down in the final 2 weeks of the December. The holiday rush has proved successful this year with the ComScore reporting that consumers have spent $27.46 billion since November 1st, a 12% increase over holiday sales last year. Have you seen similar results for this holiday season? Wednesday, December 22 – Dydacomp will close at 4pm ET for a company meeting. A limited number of Support staff will be available to handle system down and critical issue calls. Friday, December 24 – Dydacomp will be open for a half day on Christmas Eve from 9am to 12pm ET. Monday, December 27 and Monday, January 3 – Dydacomp will be closed in observance of Christmas and New Year’s, however; limited staff will be available to board tickets from 10am to 4:30pm ET. System down tickets will be responded to within the hour; however, non-critical and “how-to” issues will be deferred to the next business day. As always, in the event of a site down when the office is closed, SiteLINK Support is available at (973) 641-090. This is an emergency line for site down issues only. All non-critical issues will be handled by SiteLINK Support on the next business day. Good luck in the last 2 weeks of 2010 and we look forward to working with you all to share a successful 2011! As I mentioned in my previous blog, free shipping has been on the mind of many retailers this holiday season as just one of the many promotion techniques in their arsenals. This was to help drive consumers to loosen their grip on their wallets and spend more than last year online. Recent numbers released from ComScore indicate that free shipping orders reached their peak on Nov. 21 last year with approximately 50% of all orders receiving free shipping but declined abruptly the following week. This November, however, saw its peak a week later and higher at 55.1% during the week of November 28 with only a modest decline to 51.4% for the week ending December 5. 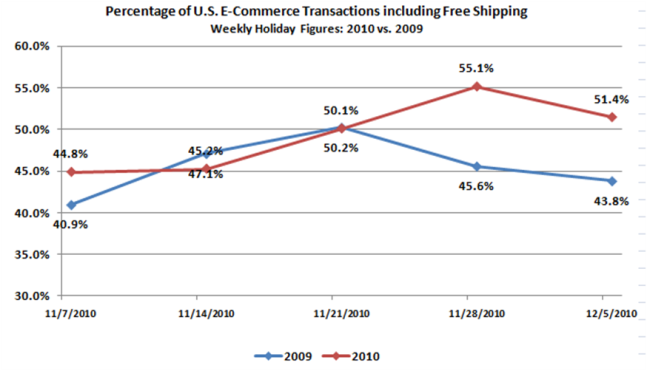 Tomorrow’s “Free Shipping Day 2010”, with over 1,500 major merchants participating, may create another statistical spike. 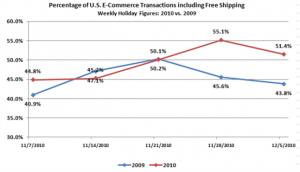 ComScore also noted that the average order totals were higher when free shipping was offered. The average order total for transactions with paid shipping averaged $86.58, while orders with free shipping averaged $125.20. This is just one of the many indicators of the importance of free shipping to consumers. For further information, check out the article on ComScore blog . Did you offer your customers free shipping? If you did, have you experienced similar results? Let us know! If not, what other kinds of promotion worked best for you this year? The Wall Street Journal Online reported today sales from the Holiday Season will be in the low to mid teens compared to last year. Click here to read this article. The article also goes on to say that promotions will drive some of that growth which leads me to question the overall profitability of the holiday season compared to the hype around online revenue growth. The other stat the article doesn’t mention is that we are seeing a greater concentration of online sales coming from a smaller universe of ecommerce and multichannel merchants. Expect that trend to continue.